Plus, a benefit block party at our new brewery September 6th. The Great Minnesota Get Together gets better every year, especially when it comes to local beer selection. This year, you can pair your deep-fried ____ on-a-stick with Fultons to be found all across the fairgrounds, including Cafe Caribe, Andy's Grill, Frontier Bar, Giggles Campfire Grill, Ragin' Cajun, the Grandstand, Coaster, Coliseum, and the all-new Blue Barn. Of special note is the return of the Land of 10,000 Beers exhibit put on by the Minnesota Craft Brewer's Guild, where you'll find flights of beers brewed all across our great state. For a more in-depth look on where to find all sorts of great MN craft beers, check out this feature just published by our friends at The Growler. If you're like us, fall isn't officially here until you've cracked your first Libertine of the year. As usual, we're in no hurry to wrap up the summer, so you won't see Libertine until mid-September (no Oktoberfests in June or pumpkin beers in July for us, thank you). Release dates for the taproom, bars/restaurants and liquor stores will be announced in the upcoming weeks. The better than ever part? 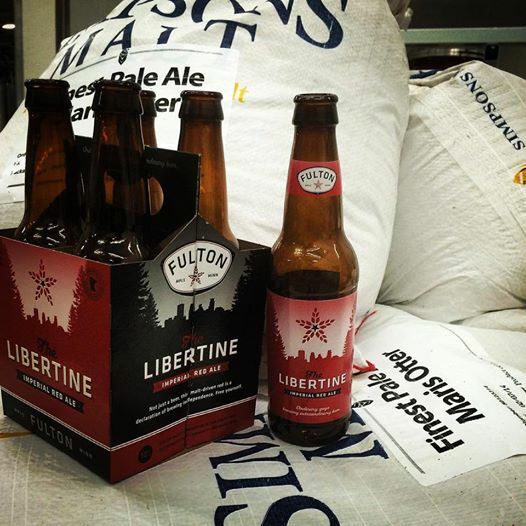 For the first time, we'll be offering the same Libertine you love in 4-packs of 12 oz bottles. It's the first of our seasonal beers to be offered in a 12 oz bottle, and also the first seasonal we've brewed at our new Northeast MPLS brewery! Another reason to look forward to fall: it's hop harvest season. In about a week, we'll be harvesting hops for the first time at the Fulton Hopyard near St. Cloud. The very next day, we'll be brewing with the fresh Cascade hops in our first-ever (other than pilot scale) wet hop beer. If you're not familiar with fresh/wet hop beers, they're about as close as you can get to drinking liquid lupulin. Hops are harvested and transported immediately to the brewery, where they'll be used in a brew without being pelletized or even dried (hence "wet" hops) for maximum retention of the most delicate hop oils in the finished beer. In our case, the hops will hit the brewhouse less than 18 hours after they leave the field. This year's version is draft only, and it will be gone in a flash, as all wet hop beers should be. The release date will be late in September, so stay tuned if you want to quench your thirst with a Minneapolis-brewed, Minnesota-hopped fresh hop ale. We're pleased to be partnering with the Minneapolis Firefighters for the second year in a row to help put on Operation Warm, a fundraiser aiming to raise $35,000 to purchase 1,000 winter coats for Minneapolis kids. Your $20 donation includes access to some of the best food trucks in the city, a silent auction, cigar roller, bagpipes, and musical entertainment by multiple bands, including White Iron Band as the headliner. The event runs from 3 - 10 pm on Saturday, September 6th in the parking lot of our new brewery, located at 2540 2nd St NE, MInneapolis MN 55418. For tickets and more information, head over to Operation Warm.